Join members of the local Audubon Society on a morning bird walk through the gardens on select Saturdays between May and June. Dates currently set for May 4, May 18, June 1, June 15, July 6, July 20. Starting at 7:30 am. More than 130 species of birds have been sighted. Tours begin at 7:30am–bring water, a camera, and comfortable walking shoes. Join our knowledgeable Arboretum staff for a summer Saturday morning walk and explore all the colorful varieties of native Northern Arizona wildflowers. June 23rd, July 28th, August 25th. Tours begin at 9:30am, bring water, a camera and comfortable walking shoes. Hundreds of colorful butterflies native to northern Arizona are on display May 24 – September 30. You’ll learn about the life cycle of butterflies, the importance of pollinators, and observe these important insects emerging from their chrysalises! Find out more here. Find out more about the 16 different species of butterfly here. 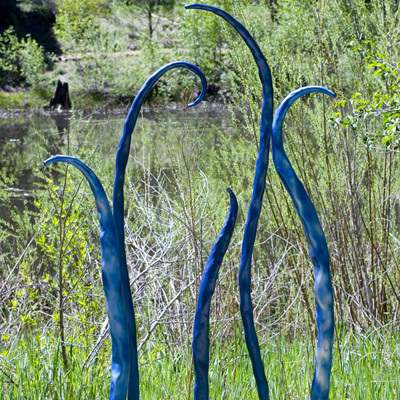 The Arboretum at Flagstaff celebrates art in the outdoors with the Botanical Blacksmiths and Friends, a collection of over 32 pieces of outdoor artwork created by members of the Arizona Artists Blacksmith Association and other artists. Artwork is installed down the main path and around and in the Willow Pond. The discounted admission fee for groups (more than 6 adults) is $7 per person. Private tours can be arranged for an additional fee of $25. Commercial tour operators and drivers are admitted free.